Twenty-Eighteen: April Photoaday Challenge Day 24!! A Picture and a Story!! April Photoaday Challenge Day 24!! A Picture and a Story!! So, today's challenge was to post a picture of something I'm grateful for. 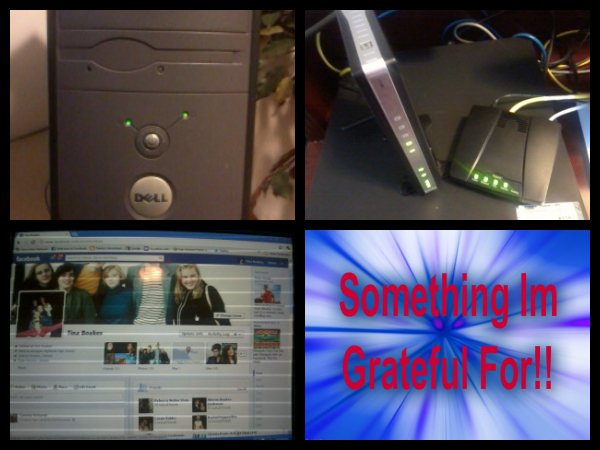 I actually had to combine 3 pics into 1 to make it 1 picture because its a combination of a few things that I am grateful for. The upper left corner of my picture is my computer. My wonderful neighbour Norah, was upgrading to another computer and this puppy still had life in it. I was without a computer of my own at the time, and Norah thought of me when she was doing her switch! I am grateful to Norah for thinking of me. This was 2 years ago and this computer is still running wonderfully! The upper right hand corner of my picture is the modem and D-link that connects me to the outside world. It is a very important part of the bottom left corner of my picture, which is a shot of my Facebook Profile. I live so far away from friends and family that aren't here where I live, that I would otherwise have not been able to find, or have been able to have contact with. Although I have complained about all the changes that Facebook has made since I joined December 12, 2006, I'm not going to do that anymore. It's a free service after all, so why should I complain. Without it, I wouldn't have been able to connect with so many people from all around that I have known and still know. So, to sum up what my picture is about, I would say, that I'm grateful for the technology that allows me to be connected to the people I love and the new friends I've made and want to get to know better!